How to Convert MP4 to PNG with Effective MP4 to PNG Converter? As we all known, movie or video clip in MPEG-4 file format is usually used for sharing video files on the Internet. More and more people choose to compress large audio or video files into a MPEG-4 file that is small enough so as to be quickly downloaded. Sometimes you just have downloaded some MP4 video clip and are very eager to save the video clip to the image file like PNG with a “lossless” compression scheme. And then you’ve come to the right place, here we would like to share you with some information and the guide on how to convert MP4 to PNG with fast conversion speed. Part 1. Why Need to Convert MP4 to PNG? PNG is an acronym for Portable Network Graphics, which could be such one kind of the image file format so as to support lossless data compression. It’s important to note that PNG was produced as an improved, non-patented replacement for GIF, which is not requiring a patent license. So far PNG has been the most widely used lossless image compression format on the Internet. PNG usually contains a bitmap of indexed colors and uses lossless compression, which is very similar to a GIF file yet without copyright limitations. PNG is generally used to store graphics for web images. Sometimes you just have the MP4 video at hand and want to capture every frame of MP4 video clips, and then outputs the frames to a series of separated PNG files or individual PNG image format. And it’s very necessary for you to convert MP4 to PNG with some certain video conversion tool. 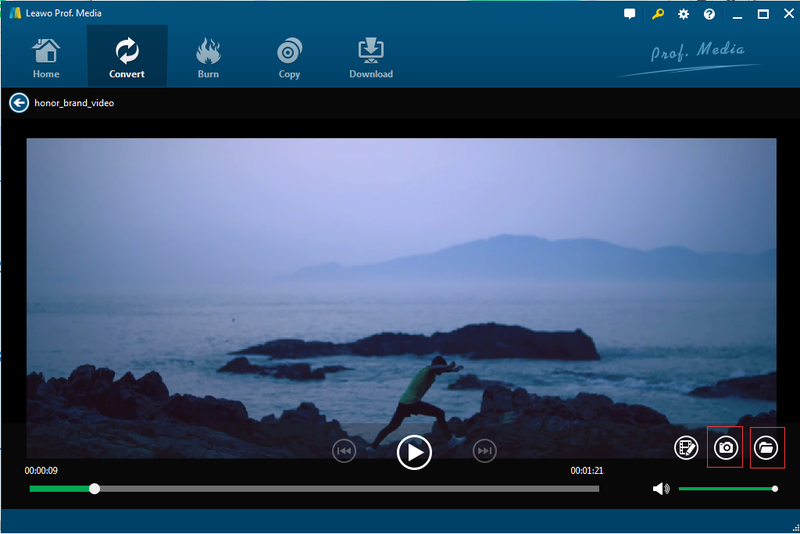 Here we would like to mainly focus on a powerful video converting software — Leawo Video Converter, which could be one good helper for you to capture the MP4 video clip and export to PNG image files with its easy-to-use interface. 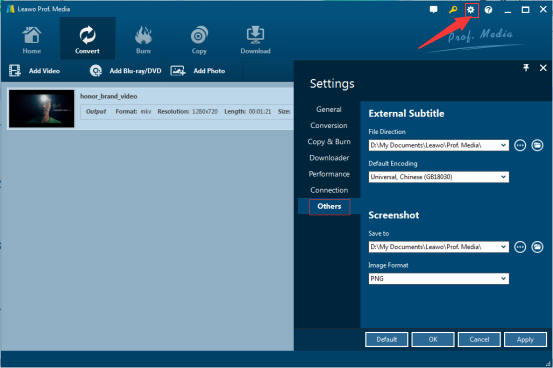 You may need to first download Leawo Video Converter onto a computer and then open the MP4 to PNG Converter smoothly. 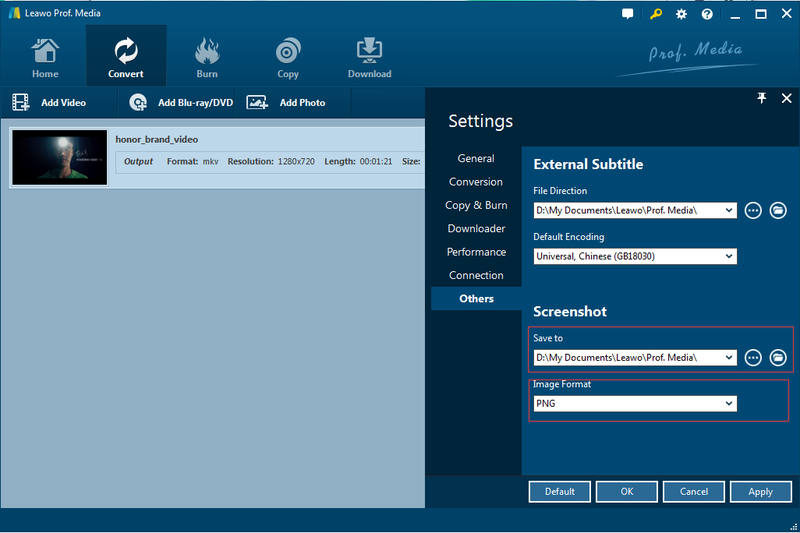 The robust MP4 to PNG Converter could provide not only different kinds of video files but also a good way to view the added video list clearly in the interface. Full use should be made of the buttons available on the interface. Here you could click the “Add Video” button to load freely the M4V video files that you want to capture. In the alternate approach, you could directly drag and drop the MP4 video files into the middle of the interface. Substantial step is often required to activate the settings window by clicking the “Settings” icon in the upper right hand corner of the interface. Now the settings window could be viewed clearly, and you may need to click the “Others” icon in the left side of the small window, and you may need to choose your desired output location under the “Save to” icon and choose the output profile as PNG under the “Image Format” icon. After all of the necessary settings are completed, and then you could click the “OK” button to close the window. You may need to click the added MP4 video clip and play the video freely in the pop-up window where you could start to screenshot by clicking the “Screenshot” button at the bottom right hand corner of the interface. After all of your desired screenshots have been finished, you may need to click the “Open screenshots folder” button to find the screenshots easily. Apart from the robust Leawo Video Converter, there’re some other MP4 to PNG Converters Online for your reference like mp4togif.com, Free Online PNG Converter and many more. Here we would like to give a brief introduction to some of them like Free Online PNG converter as the typical example and show simple steps with pictures. Below is the tutorial on how to convert MP4 to PNG easily for your reference. Step 2.Click the “Add Files” button to import your desired MP4 video clips easily. Step 3.You may need to click the “Start Convert” button to begin the converting process. After all of the conversion job is completed, and then you may need to click the “Download” button to free download the converted files. Given all that, despite the fact that Free Online PNG Converter is one totally free MP4 to PNG Converter Online, its functions are still very limited, for example, the allowed max size of the added video clip is 10 MB. And the editing functions are also very simple. Differing significantly from Free Online PNG Converter, Leawo Video Converter comes up with such great tool for you to convert MP4 to PNG or some other popular video/audio/image files with the best quality. Moreover, you could also customize your specified screenshots settings as you like. Leawo Video Converter is one all-in-one video/audio conversion tool for you to fulfill your needs of conversion while keeping its original quality.